Our April 2011 artist-in-residence is Carmen Lomas Garza, a local artist renowned for evocative depictions of her childhood in a South Texas Mexican-American community. Her pieces, filled with traditions, memories and anecdotes and reflective of daily life and a sense of communal identity and shared pride, are filled with a cultural joy and incredibly personal in their perspective. Viewers are able to engage with her art no matter his or her background and, as you become captivated by their warmth, the layered narratives, and the rich use of color, you will find yourself suddenly privy to a world of details that serve to educate and inform about the Mexican-American experience. Her works are filled with traditions, memories, and anecdotes. While you visit her studio, join Garza in making papel picado, the decorative paper cut-outs that are a significant feature of and inspiration for her art. Make sure to attend Friday Nights at the de Young on April 29 from 6 to 8:30 pm for her the closing reception for Garza’s installation With the Blessing of Corn in the Kimball Education Gallery for light refreshments and live music. For more information on her residency, which continues through May 1, visit here. 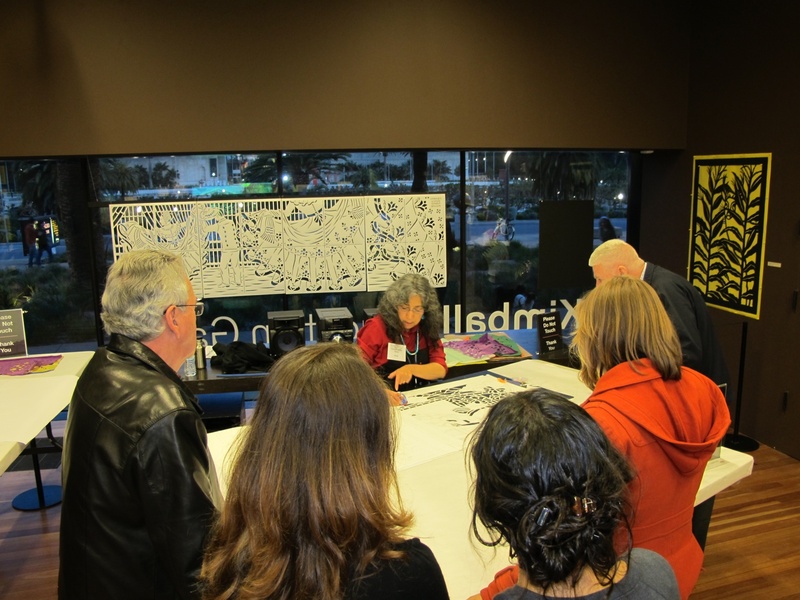 We sat down with Carmen and talk to her about her journey as a Chicano artist. She has mucht to say about her personal history, her experiences learning about the business of art, and her commitment to art education and the Chicano movement, among other topics. What inspired your interest in visual art? Oh, wow... I’d have to go back to when I was about 3 or 4 years old, being carried in my mother’s arms and being mesmerized by the designs on her dress. That’s my first memory, period, and certainly my first visual memory. And then I’ve just always been interested in the visual arts. When I was a kid in elementary school we had art classes, but, more importantly, my mother is a self-taught artist and she was always making things and doing paintings and water colors, making paper flowers and embroidery. She was very skilled, on her own, and always leading the family and community in cultural activities. She was the one that revived the Christmas celebration of Las Posadas, where are a girl and a boy are chosen to play Mary and Joseph, marching down the street like Joseph and Mary looking for lodging. She would make crepe paper flowers for the Day of the Dead, November 2, and we would make crepe paper flowers that were dipped in hot wax. This is before plastic flowers. And then, on November 2, we would go into the cemetery, take all of our gardening tools, and then we would sit down and carefully clean up all the graves and decorate them with the paper flowers we made. And while we were doing that, our relatives would be telling stories about who was buried where, and we would learn about family history. So, art was really tied into your life and community from a really young age. Oh yes, not just my mother but my grandmother also, she did a lot of crochet, a lot of embroidery. My father was a sheet metal worker and was good at building things. He was another big influence. As I got older, I got to take art classes and studied more about art history, and then kept on doing it when I was an undergraduate student studying art education, and that’s when I decided I wanted to be a full time artist and dedicate my artwork to the Chicano art movement so that other Mexican Americans seeing the artwork would see a familiarity in the imagery and be inspired by what they see in the fine art format. That’s been my goal since 1969. What you see in my work are recollections from my childhood growing up in South Texas in Kingsville, so there are a lot of family scenes, every day events. It seems like a lot of your work is about recognition and the sort of daily rituals that people can connect with. I wanted to have these kinds of images because other Chicano artists were doing imagery that was very political, sending messages about oppression and discrimination, honoring the great muralists in Mexico, and protesting the Vietnam war because a lot of Chicanos had been drafted into the army. There were a lot of protests against the war and the draft. I just wanted to focus on the every day life that we’re all very familiar with. We needed to re-celebrate that: the beautiful things that we have always known and grown up with. Some of us were made to feel ashamed of our language, our traditions, our food. You don’t think about it, but everyone eats burritos and tacos, Mexican food, food from Cuba, from South America, without even questioning it, but when I was growing up we were the only ones eating those things. Part of the intent of the Chicano movement was to bring about a greater awareness of what was going on in the Mexican American community. You have to remember that a lot of our families have been in the United States for many generations, going back to before it was the United States, and for some even further back because a lot of us have Native American ancestry from not just South but also North America. My maternal family is native to South Texas and my father’s family comes from Mexico and further back, going back to 1440 in Southern Spain and the Canary Islands, and there’s a lot of history there. My Garza ancestors were cattle ranchers, helped to establish Monterrey in Northern Mexico and ranches in South Texas. So our family histories go back a long long ways. Everyone thinks we’re recent immigrants, but we’ve been here for a long time. So, that has always been one of my focuses: to re-celebrate our traditions, our history, and to raise awareness. The nice thing is is that we’re sharing it with everyone else. A lot of people recognize: they understand, and that’s a great bonus. Originally my intent was to focus on the Mexican-American community, bu it’s been a great bonus that everyone else can enjoy it and find it familiar. I feel like your imagery is very inviting and someone outside the Mexican-American community can enjoy it and find a way into it. I made the decision when I was a senior in undergrad that I couldn’t afford to lose my audience, to do artwork that people wouldn’t understand. For example, I felt like I couldn’t do abstract art because you have to have a very special eye to see and appreciate that, so I wanted to do work that would pull you in, all ages, from all kinds of backgrounds, and so that’s been my focus. I’ve relied heavily on my own memories of growing up in South Texas, and then as I’ve grown up, you know, more memories, more observations, more events, more happenings, and occasionally I’ll do a fantasy, like Tito’s Gig on the Moon, about my favorite musician. When he passed away, there were a lot of stories about him, and one of the things I heard on the radio was that he was always quoted as saying he wanted to be the first musician on the moon. Of course he didn’t do that, so I gave him his fantasy by doing this painting. I put him on the moon with all these other musicians. There’s no cast shadows because they’re just spirits floating over the moon, and some of the instruments are pure fantasy, like the c-shaped piano, and all the sounds that are coming out of the instruments end up on the clothing of the dancers. So you delve into the imagination, beyond literal memory. ...into what I call fantasias: just sheer fun, floating away and just having fun. How do you think being in this particular gallery space and participating in the de Young artist-in-residence program have added to your project? Well, I think it’s a great place for my work. I was hesitant at first because it’s not the same kind of energy space like the regular galleries in the museum. It’s an education gallery, so there’s an informal aspect and we have to be careful that it doesn’t get too informal. But what’s great is getting to interact with people, and it’s been a lot of fun to have people come up to me, telling me, “I grew up with your artwork, I saw your work in my Spanish text book, I use your books in my psychology class” --all kinds of reactions. I publish a lot of text books also, so teachers, parents, and librarians are coming in telling me that my books have helped them in their curriculum and in their classes, and that’s even greater to hear that, that my work has helped so many teachers and parents reach out to their kids and teach them to read and to write; to inspire them to write, narrate, and then tell their own stories. It seems that you’re very much invested in art education and art as education. I think I got that from my mother even though she was not a teacher. She was always teaching us how to do things, how to live, and how to comport yourself. And then my undergraduate training was in all-level art education, and I did teach one year in a public school and decided, well I really want to be a professional artist. Then I had a chance to go to graduate school, so I left after 1 year of teaching, and then I worked in a couple of places in Texas. I went to graduate school and then came to SF, and I worked for the Galería de la Raza. I worked there for five years. It was better education than any degree program, any academy of art, because you’re right there in a community art gallery and you’re dealing with artists, board members, the public, staff; you’re learning about the non-profit structure, and you get to curate exhibitions. I got to curate the Frida Kahlo exhibition in 1978 with the help of a committee of artists and other members of the staff of the Galleria. At that time, to plan a show a year in advance was a big deal because the Galería was planning things three or four months in advance and I decided we needed to do at least a year. On November 2nd, when we were having our annual Day of the Dead opening for the annual Day of the Dead show, I asked if we could have next year’s show dedicated to Frida. So, they agreed, and right then and there I pulled out a folder and started asking the artists if they would participate in next year’s Day of the Dead show dedicated to Frida. We set up a committee of friends, artists, and scholars who would help us to do workshops and teach the artists about who Frida was. We met people who knew Frida and Diego, who were muralists with Frida and Diego, and we got to interview them and talk with them, and they also participated in the big show we had at the Galería de la Raza. It was a great experience--a lot of work, but a great experience. It sounds like the Galería de la Raza was a crucial point in your journey as an artist. I worked there for 5 years and stopped in ’81. I planned it so that I could save up and have at least one year of working on my art work. At the end of that year, I was running pretty low on funds, but then I got a grant from the National Endowment for the Arts, which saved me from crash landing, and I’ve been self-employed since then—1981. And I have my studio with the Hunters Point Naval Ship Yard, and I’ve been there since ‘85. It’s only about 320 square feet, and I have a storage cage in the basement, but in that little space I’ve been able to make all of this art work. When I design something, it has to break down into parts so that it’s easy to store and easy to ship, because storage is expensive. I try to design all my work so that I can port it myself, carry it myself, store it myself - it’s a big, big factor. I try to tell young artists: “think about all the things you’re going to have to deal with, if you do a large painting how are you going to store it, ship it, how are you going to get the money to do that.” I had to learn the business of art the hard way, because the art institutes in the ’70s weren’t teaching it. Now, there’s a lot more available, there’s a lot more publications available on the business of art, there are classes on it, but there are still not enough universities that teach how to survive and prosper as an artist, and certainly every graduate student should have some training. Once you graduate, what then? If you’ve been borrowing money to go to school, that’s a lot of money you’re going to have to be paying back. When I get invited to universities to lecture, I always ask to meet with the students to talk about the business of art, you know, like a workshop, at least to get together with the faculty and the students and question the faculty about what they’re doing to prepare at least the graduate students on the business of art -- and it’s amazing how there’s still not that much preparation. There’s still a large percentage of students that graduate with very little preparation. They may get info about how to get a portfolio together and a resumé and all that, but that doesn’t tell you anything about how to negotiate a contract, how to keep records, how to get a business license, how to promote your work, how to market it, how to prepare yourself and protect yourself from gallery dealers. It’s constant research. I’m always learning about the business of art. It changes a lot. It’s a crazy world. I’ve noticed a distinct contrast between your prints and cutouts. The former are on a smaller scale and the metal pieces are almost monumental. How would you describe your artistic technique and your choices of medium? I don’t see any difference—I’m just enlarging it. Whatever I’m working on, that’s what is most important for me right at that moment, so I don’t place any greater value on the prints or the cutouts. They all give me the chance to tell my story. That’s what I need, that’s what I want: to tell my story. It seems that, no matter the medium, it’s just a means to convey that narrative. Yeah, and it provides a format that is sometimes challenging, but that’s the fun part. What are the limitations, and what are the possibilities? When I do a commission, that’s a big challenge. I not only have to stay within the style that I work with, but then I also have to satisfy the person who’s commissioning the work with imagery that is both meaningful for me and for them. I don’t do commissions just whenever. I’m very choosy. The work that I did in Houston for New Hope Housing was a project where they had already seen my cutouts and my paintings, and they were very familiar with my work. They felt that the kind of imagery that I do would fit that space for those four buildings. So, I proposed six or seven ideas and then they narrowed it down to four. It was a lot of fun, but there were a lot of restrictions in that I could not have any holes on the metal cutout wider than six inches, so on my paper cutouts I couldn’t have any holes wider than an inch, and I couldn’t have any sharp points, and that was another huge challenge. You can see on the garden scene that I had to do it in reverse. It was a silhouette. I had to cut out the lines themselves, because there were too many points in the plants and the flowers. When you start looking at nature, nature’s really mean. There are a lot of sharp points everywhere to keep the enemies from eating them up. So, that was a big challenge, but it worked out really well. They were really happy, and they’ve gotten awards already. So, it seems like you explore the limitations of the different mediums and situations - you deal with them and see how it affects your work. Yes, and sometimes it takes me into spaces where they want me to go beyond what I’m familiar with. For example, this new commission that I’m working on, one of the requests was to have African quilts somewhere, and I needed to do research on that, and I also wanted it to include modern dance, modern b-boy dancing. So, I figured I’d just put the quilts behind the b-boys. But the quilts that were behind the b-boys were the kinds of quilts that were used in the 1800s by slaves who were trying to run away to the North. Even after the Emancipation, they were still having to deal with slave owners trying to keep them confined to where they had been before and now they were free so they could get away. Other former slaves would hang their quilts to leave a message for those who were trying to get away: “go this way to go north.” So, you follow the geese that are flying north. There were also quilts called Drunkard’s Path, which would say, “Don’t take a straight light on your escape, take a zigzag, or even reverse yourself.” Different quilts had different messages, and they would hang them on the clothes lines or on the porch. This was a history that I had to do research on because I was not aware of that. And I had so much fun doing that in order to be able to create that one image as a part of a set of 14 images, some of which were about dance, including Tai Chi dance and dancers. They wanted something about the Chinese community. It’s a very traditional, beautiful form of dance, and so I did research on that as well and included it in one of the 14 panels. So, commissions sometimes take me into a different space, but I try to make it my own. What’s the significance of using the papel picado as your way of engaging with the public during your residence? Well, before I was doing these big elaborate metal and paper cutouts, I was doing tissue paper cutouts as a kid. When I was growing up, my grandmother taught me how to use scissors to cut paper. I distinctly remember her because she would fold the paper and make patterns to trace onto fabric to do embroidery designs, so she would make flower patterns by folding and cutting the paper. And we did some paper cutouts. When I was a young college student, I picked up a book on Mexican folk art and it had a section on tissue paper cutouts from Mexico, and I thought, “Oh I know how to do that,” and so I started to make the cutouts. In Mexico, they stamp cut them, they use a hammer and chisel. They take a stack of tissue paper and put a drawing on top of it and then they cut through the whole layer all at once, and they have to draw it so that everything is connected. And I thought, “Well I can do that,” but instead of cutting tissue paper I’m going to cut better paper, and I just took off. I kept working on it and eventually got to metal cutouts. I had always wanted to do metal cutouts, something more permanent, and I was eventually introduced into plasma cutting and laser cutting. I do the fun part: I do the cut out and get someone else to fabricate it and paint it. So, the tissue paper cutouts and the book that I wrote about paper cut outs are ways to get people started on the whole thing and let them know that they can do it themselves. You don’t have to have a lot of skills to successfully make a tissue paper cut out. You just fold the paper and cut with scissors. It’s very accessible, and when you’re doing it it’s very therapeutic. Your mind just floats into it and you forget all your worries. And when you unfold it, it’s a complete surprise, and not only that, you see that you’ve done something beautiful and successful. And all of that effort for that moment. That’s what it’s for: that moment of joy.